On Thursday PokerStars’ years-long promotion “The Road to 100 Billion” finally came to a close when at a $.02/$.05 six-max No Limit Holdem table a player from Greece won hand #100,000,000,000 on PokerStars. The player, with the fitting name of Microulis69 (gotta respect anyone who plays micro-stakes and puts the word micro in their screen-name) pocketed $103,800 for winning the hand, while his five opponents walked away with between $12,460 and $13,440 simply for being in the right place at the right time. The milestone hand wasn’t expected to hit until towards the end of the month, but with the increased traffic from all of the giveaways taking place in the weeks leading up to the hand (prizes were awarded for every milestone hand beginning at 99,700,000,000) PokerStars’ players managed to push that timetable up a couple weeks. 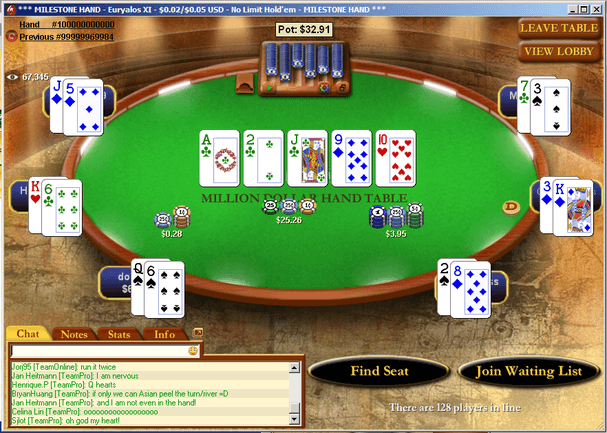 The 100 Billion Hand Celebrations began on Friday and has paid out more than $2m to PokerStars players (see them all here). But the party isn’t not over yet. There’s a $300,000 World Record attemp taking place this Sunday which costs just $1 to enter, a $1 million guaranteed Zoom tournament on 23 June, and a $1 million Golden Sit & Go promotion (17-23 June). Find out more about all of those by clicking here. And don’t forget to Zoom & Boom when that kicks off for extra cash. It took PokerStars nearly a decade to reach 50 Billion hands dealt, which they did on September 21, 2010, but in less than three years the site has managed to deal out another 50 Billion hands, despite Black Friday. It’s absolutely amazing to think of how far PokerStars has come since their 2001 launch (little known fact: PokerStars play-money site launched on the ominous date of September 11, 2001) and despite the tremendous upheaval in the online poker world, UIGEA and Black Friday, PokerStars seems to just keep growing stronger.